Adam Glass turns in two stories in the Teen Titans Annual. The lead story will probably get more attention, but I really preferred the second one. 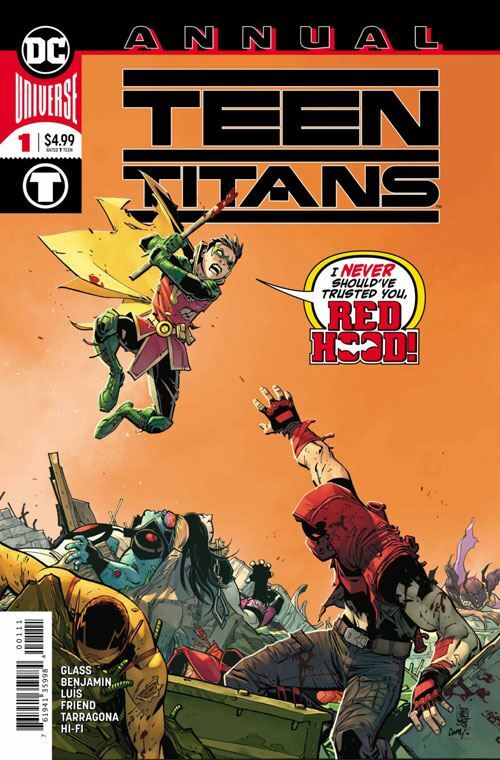 The cover, and opening story, are devoted to Robin facing off against the Red Hood. I have always been a big fan of Damien Wayne, and never particularly cared for Jason Todd, so my bias in the fight was clear. Sadly, since the reason for the conflict is Damien’s paranoid nature, and his secret prison, it’s Jason Todd who winds up with the moral high ground, a rare position for him to be in. It’s a good story, don’t get me wrong. Some intense fighting, and even some solid introspection by Damien before it’s over. But I still wound up loving the second story far more. That tale takes place at the same time, using the rest of the Titans, but really giving the focus to Djinn. The team have to deal with an obnoxious teenage villain, a guy called Joystick, who has the ability to control others. Joystick is a great name, conveying both his power, and also his childish attitude towards his actions. The Teen Titans are just as vulnerable to Joystick’s abilities as anyone else, but Djinn is able to turn the tables on him. Glass is really doing a great job with the newbies on the team. Djinn, Crush, and Roundhouse each add a fresh dynamic to the group, and I find all three to be genuinely interesting characters, ones who I want to see more of. So giving Djinn some special focus in this story was probably the defining factor that made me enjoy the second story more. No, ok, no lies. I love Joystick as a villain. Comes down to a silly name. I’m so ashamed.